Dr. Gregory Simon says research is needed to see if this new drug for persistent depression will prevent suicides. An FDA advisory panel recently recommended approval for esketamine, the first of a new family of antidepressants. To get a better understanding of existing research of the treatment and what needs to be learned in the coming years, we asked 6 questions to Dr. Gregory Simon, MD, MPH, a psychiatrist at Kaiser Permanente Washington and a senior investigator at KPWHRI, who has done pioneering work to improve how to identify and help people at risk of attempting suicide. 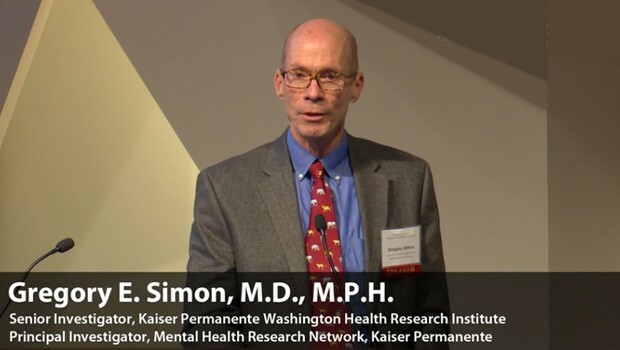 Dr. Simon is also principal investigator for the Mental Health Research Network (MHRN), a consortium of 13 health system research centers embedded in large health systems. MHRN is funded by the National Institute of Mental Health. 1. Does the research tell us whether esketamine will be more effective than the current anti-depressants? Gregory Simon: So far, esketamine has been studied for a very specific situation: an add-on treatment for patients who have persistent depression after trying at least two standard antidepressant medications. In that situation, adding esketamine has been shown to significantly reduce symptoms of depression and suicidal ideation compared to just continuing the standard treatment. Esketamine has not been studied as a first-time treatment, and it will not be approved for that purpose. 2. What does the research show in terms of its effectiveness in preventing suicide? GS: As is typical for pre-approval studies of a new antidepressant medication, the clinical trials of esketamine have included several hundred patients. This number is large enough to evaluate effects of esketamine on symptoms of depression and suicidal ideation. But it would take studies ten or even one hundred times as large to evaluate effects on risk of suicide attempt or suicide death. 3. What sort of research do we need going forward to determine how to use this new drug? GS: Within our Mental Health Research Network, we are planning to use records data from several large health systems to examine effects of esketamine on risk of suicide attempt and psychiatric hospitalization. We hope that will include both observational or naturalistic studies (studying people who receive esketamine treatment in usual care) and actual randomized trials (where patients might be randomly assigned to be offered esketamine). Randomized trials are less liable to bias, but also more challenging to actually perform. 4. When Prozac was first introduced, the claims accompanying its efficacy, in hindsight, raised unrealistic expectations. Are we at risk of repeating that response with esketamine? GS: In the end, we discovered that Prozac certainly had fewer side effects than older antidepressants but was not more effective. That difference was worth something, but it certainly was not a revolution. There is hope that esketamine will be a more fundamental advance, but the data available now are just not enough to settle that question. 5. What has research told us about risks of esketamine, and what are the gaps? GS: Esketamine is a close relative of Ketamine, an anesthesia medication that has been available for many years. Ketamine also has a long history of abuse as a “party” drug. There are certainly concerns about the possibility of abuse, tolerance, or dependence with esketamine. The short-term, highly controlled studies done so far cannot really evaluate those longer-term risks. 6. Anything else you want to add? Any positives that we may have missed in focusing on the challenges? GS: Esketamine will be the first fundamentally new medication for depression in decades. The potential upside is large, but we have significant uncertainty about risks. We are hoping to answer those questions quickly using the large-scale research infrastructure that our Mental Health Research Network has built.